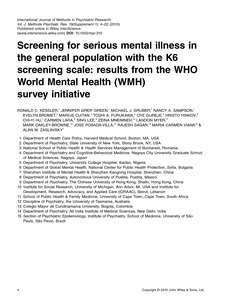 Data are reported on the background and performance of the K6 screening scale for serious mental illness (SMI) in the World Health Organization (WHO) World Mental Health (WMH) surveys. The K6 is a six-item scale developed to provide a brief valid screen for Diagnostic and Statistical Manual of Mental Disorders 4th edition (DSM-IV) SMI based on the criteria in the US ADAMHA Reorganization Act. Although methodological studies have documented good K6 validity in a number of countries, optimal scoring rules have never been proposed. Such rules are presented here based on analysis of K6 data in nationally or regionally representative WMH surveys in 14 countries (combined N = 41,770 respondents). Twelve-month prevalence of DSM-IV SMI was assessed with the fully-structured WHO Composite International Diagnostic Interview. Nested logistic regression analysis was used to generate estimates of the predicted probability of SMI for each respondent from K6 scores, taking into consideration the possibility of variable concordance as a function of respondent age, gender, education, and country. Concordance, assessed by calculating the area under the receiver operating characteristic curve, was generally substantial (median 0.83; range 0.76�89; inter-quartile range 0.81�85). Based on this result, optimal scaling rules are presented for use by investigators working with the K6 scale in the countries studied.